Recovery from addiction doesn’t always go as planned. The path to sobriety comes with challenges, and many recovery journeys include a period of relapse into alcohol or drug use. Relapse is a normal but dangerous phase of recovery. This is why it is best to have a solid relapse prevention plan. With hard work and a positive attitude, it can be avoided. It can also be overcome if it occurs. 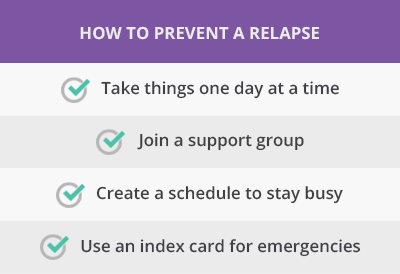 Relapse is a normal part of recovery from addiction to alcohol or other drugs. Addiction is a chronic disease of the brain, meaning it lasts for multiple months and affects the way the brain works. Substances of abuse change the way that the brain operates, causing people to compulsively seek addictive substances despite harmful consequences. Restoring normal brain function is difficult, which is why many people relapse during recovery. Depending on the duration and severity of a person’s addiction, it can take months or years of abstinence for the brain to recover from substance abuse. During that time, triggers and cravings can cause relapse. Rehab helps people overcome addiction. Some people never fully recover, but they learn to cope with symptoms of the disease. Most people in recovery from addiction are always vulnerable to relapse. Between 40 and 60 percent of individuals in recovery experience relapse. But relapse is an expected part of recovery from several chronic health conditions. For example, between 30 and 50 percent of patients with Type 1 diabetes relapse, and between 50 and 70 percent of people with hypertension relapse, according to the National Institute on Drug Abuse. Between 40 and 60 percent of individuals in recovery experience relapse. Using drugs once during recovery doesn’t necessarily mean that a person has relapsed. A single use is usually referred to as a “slip.” Some people can slip without relapsing, but drinking or using increases the chance of relapse. Relapse rarely occurs in a single day. It usually begins weeks or months before a person slips for the first time. A person goes through numerous motions before fully relapsing. Researchers have divided those phases into three easy-to-understand stages. During emotional relapse, people aren’t considering drinking or using. However, they aren’t practicing coping behaviors or proper self-care. In short, they’re setting themselves up for failure. Poor self-care leads to negative emotions, feelings of unhappiness and increased levels of stress. As people continue to practice poor self-care, they transition into a mental relapse. During mental relapse, people start to consider using alcohol or other drugs. They know they shouldn’t, and they may try to practice coping behaviors. However, their negative mindset continues to negate other protective factors. People, places and things associated with past drug or alcohol use can trigger cravings. People in mental relapse may romanticize past substance abuse or minimize the negative side effects of drinking or using. They may start to lie or look for opportunities to relapse. In some cases, they may even plan to relapse. The final stage of relapse begins with a slip or use. Sometimes people regret using or drinking after a slip and find a renewed passion for recovery. A friend, family member or therapist may find out about the slip and help them access resources or find motivation to prevent relapse from occurring. However, people who slip and don’t seek help often experience a physical relapse. They begin using obsessively or compulsively, and they start to experience negative consequences from that use. As people progress through the stages of relapse, they exhibit various warning signs. By recognizing warning signs that you or a loved one may be headed for relapse, you can take steps to prevent it from occurring. Some people can overcome physical dependence to a drug without committing to living a healthy life in recovery. Dry drunks, for example, are sober people in recovery who continue to engage in risky behaviors that increase their risk for relapse. Signs of a dry drunk include attending bars, refusing to seek therapy and obsessing over alcohol. Friends and family members can recognize outward warning signs and try to intervene before a full relapse occurs. People in recovery from addiction may relapse for several reasons. Old memories can trigger intense cravings for the substance of abuse. People with unhealthy coping habits may believe that using alcohol or other drugs is the only way to relieve stress. The best way to prevent relapse is to practice coping behaviors consistently, build a support system and avoid risk factors. Individuals who cut back on support group meetings, stop practicing coping behaviors and begin to think they can control their drinking or drug use increase their chances of relapse. In general, you can reduce the risk of relapse by obtaining steady employment, maintaining a safe and stable home environment, attending support group meetings, practicing stress-relief techniques and finding a purpose in life. Emotional challenges may also cause relapse. The recovering brain is susceptible to depression, anxiety and other mental health issues. Using drugs or alcohol can seem like the easiest way to feel happy or normal. Loneliness and a lack of social support can also make alcohol or drug use more appealing. People who attend therapy learn skills and strategies for preventing relapse. During rehab, many people create specific plans for risky situations or times when they feel tempted to use drugs or drink alcohol. Relapse prevention plans should be easily accessible and realistic. They can be detailed or simple. A relapse prevention plan can be a list of reminders written on a note or mobile app. Or it can be a journal or workbook where you develop a comprehensive list of risky scenarios and the corresponding actions to take to maintain sobriety. Many people are embarrassed by their addiction, but having the disease of addiction is not shameful. Being open and honest about your recovery allows friends, family members and co-workers to support you when you need it. Including others in a relapse prevention plan can help the plan succeed. Relapse doesn’t equal failure. A diabetes relapse is characterized by unhealthy eating behavior. When people with diabetes relapse, it doesn’t mean they failed. It means they have to try again and continue to practice healthy eating. They may need to see a doctor or nutritionist and develop a healthy diet plan. When a person with a substance use disorder relapses, they need to take similar steps. Supervised detox is usually necessary to overcome withdrawal. A severe relapse may require inpatient treatment, but outpatient therapy may be appropriate for some people. During treatment, clients will learn why they relapsed and take steps to prevent another relapse in the future. One of the most dangerous aspects of relapse is the increased risk of overdose. When people use alcohol or other drugs for a long period of time, they develop tolerance. That means they have to take higher doses of the substance to feel the same effects. Tolerance can begin to decrease after a few days of sobriety. People who maintain sobriety for several weeks or months become much less tolerant than they were in the past. If they relapse and use the same dose that they used during active addiction, their risk of overdose is high. If an overdose does occur, it can be fatal. The first thing you should do after recognizing that relapse has occurred is find safety. That may mean calling 911 if you think an overdose is possible. If you don’t think 911 is necessary, contact a sponsor, therapist or loved one you trust who can get you help. Once the danger of overdose is removed, you should reach out to your support system and find a safe living environment. The immediate goals should be to remove access to alcohol or other drugs, shield yourself from negative influences including friends who drink or use drugs and begin to search for addiction treatment. The intensiveness of treatment is dependent on the severity of relapse. Supervised detox may be necessary to safely overcome dependency and withdrawal symptoms. In less severe cases, outpatient therapy and support groups may be adequate. Insurance plans are not allowed to impose lifetime or dollar limits on substance abuse coverage, so treatment is covered regardless of how many times a person has received treatment in the past. Many people who relapse multiple times begin to lose faith that they can recover. They’re unsure how to quit relapsing. In some situations, they make the same mistakes repeatedly. For example, they may attend clinics that provide detox but not therapy. Therapy is crucial to recovery. Or they may attend therapy for only one to two weeks. In many cases, 30 days of residential treatment and multiple months of therapy are required to prevent relapse. Some people return to high-risk situations after treatment. They live with spouses who use or drink, or they keep the same group of friends. In some situations, people must end relationships with others to fully recover and live healthy lives. Brett Watson shares how he recovered following a relapse. Addiction isn’t a disease that can be overcome in weeks or months. Most people in recovery are always at risk for relapse. They recognize that they can’t have one drink or let their guard down for a single day. They’re constantly practicing coping skills, stress-relief techniques and healthy habits. Some people attend support groups for their entire lives and find happiness in supporting others trying to overcome addiction. Others surround themselves with protective factors that motivate them to stay sober. They find stable employment, start a family or engage in healthy hobbies. Relapse is an obstacle on the path to recovery, but it’s an obstacle that can be overcome. If it’s used as a learning opportunity, it can be the last major obstacle on a path toward a happy and fulfilling life.